Deepen your Heart Connection with HeartCloud™. 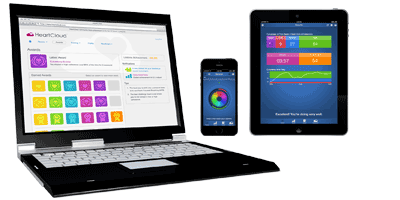 HeartCloud™ is a cloud technology available for hundreds of thousands of HeartMath technology products users. A new on-line platform that syncs all of your session data and tracks activity, history, journaling, notifications, awards, access to advanced training and much more. Users now also have the added benefit of synching their HeartMath technology devices and accessing all their session data in one location via the HeartCloud. Their HeartCloud accounts are for free. HeartMath´s HeartCloud connects with all of the HeartMath heartrate Variability (HRV) monitoring and coherence buildinge technologies including emWave®Pro, emWave® 2 and Inner Balance™. The new platform helps users build on their training experience, achieve rewards for their succes and share their results with others. For a printable version of the HeartCloud Manual: click here.